And check out OUR NEWLY LISTED ITEMS. This is an original printed proof page for the classic newspaper comics strip Peanuts, by the legendary Charles M.
Schultz legendary writer and artist of the Peanuts strip, and creator of Snoopy, Charlie Brown, Woodstock, Linus, Lucy, Peppermint Patty, Pigpen, Schroeder, Marcie, Sally, Franklin, Rerun, etc. 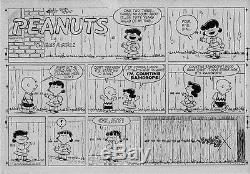 This small-size proof sheet is for the August 29, 1954 (8/29/54) Peanuts Sunday page. The page measures approximately 10" by 7", and it is on smooth coated quality stock, not regular paper (and again, please note this is a printed proof, it is not the hand-drawn original artwork). You can see printer key symbols in the margins. The piece is in very good condition, particularly for its age more than 60 years old! And it's a truly great example, featuring some classic Peanuts humor! This is a great piece for any collection for a fan of the strip or the Peanuts cartoons, and would look great framed and prominently displayed. Please note that this is an authentic piece from the 1950's, not something made for a later reprint or collection book. We have been told there are reprint production art pieces being listed by other sellers that make them seem to be old and from original printings, even though they are not for example, older production art did not have the words on a separate sheet from the images. Those kinds of things were only done much more recently, using computer technology. We advise buyers to be careful, as there are disreputable sellers tricking many people into believing they are purchasing items that are older and more valuable than what they actually are. Some sellers simply do not state their items are from reprints, while others make very long listings and put a tiny mention about reprints buried deep in the listing, and/or use a hard-to-read font color (like yellow) to prevent buyers from seeing this information. Unfortunately, everything else in the listing the title, pictures of the cover of the comic from the 1st printing, etc. This item is a genuine proof from the'50's, not something made for a reprint. Check out our other auctions for more great items. Check it out, you'll be glad you did! The item "1954 PEANUTS CHARLES SCHULZ ART ORIGINAL PRODUCTION PROOF SUNDAY PAGE RARE EARLY" is in sale since Tuesday, April 08, 2014. This item is in the category "Collectibles\Comics\Original Comic Art\Comic Strip Art".